How to Build Twin Corner Beds With Storage | DIY projects for everyone! 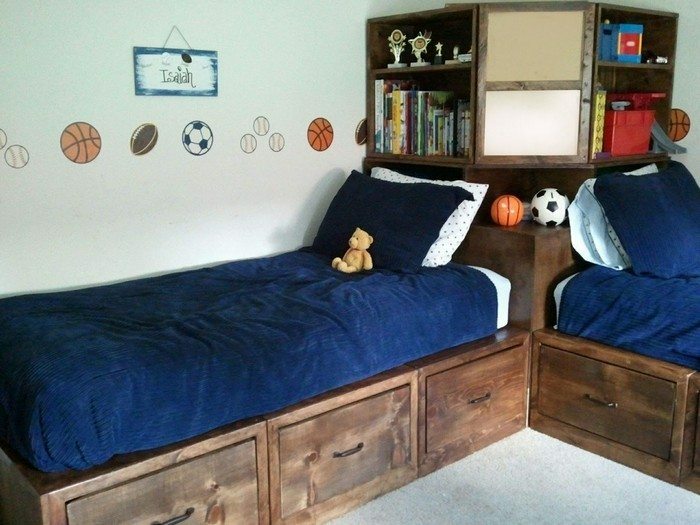 Need a good bed design for two little kids sharing one room? Here’s one that maximizes use of space! Kids will surely love this bed idea since no one gets the ‘bigger’ space or ‘nicer’ bed. Both get exactly the same amount of space and storage. And while this is considered one whole unit, there’s still a sense of ownership in their respective areas. The kids have the same bed size, the same shelving and the same number of storage under the bed. They also have shelf space for things they like to share! Not only that; this bed design also allows for efficient use of the entire room’s space! Because this is a corner bed, the kids have one large area in the middle for playing and other activities. Adults will love it, too, as this design definitely makes the room look tidier and easier to clean! Clever isn’t it?